Earlier this week, I promised a unique post for today's YAWS, and here it is! Drawing from the post, two weeks ago, on broad-edge lettering (and my attempts thereof) and the post from last weekend on a transcription of Tolkien poetry in Tengwar, the alphabet of Tolkien's elves, I present to you: broad-edge lettering applied to the Tengwar alphabet. A bit of nerdy background... Tolkien's two primary elven languages are Quenya and Sindarin. While they both use the same alphabet, the Tengwar, each uses it in a slightly different way, or "mode." Notice the curls, lines, and dots above what appear to be the main letters? Those "additions" represent vowels, and the large letters represent consonants. 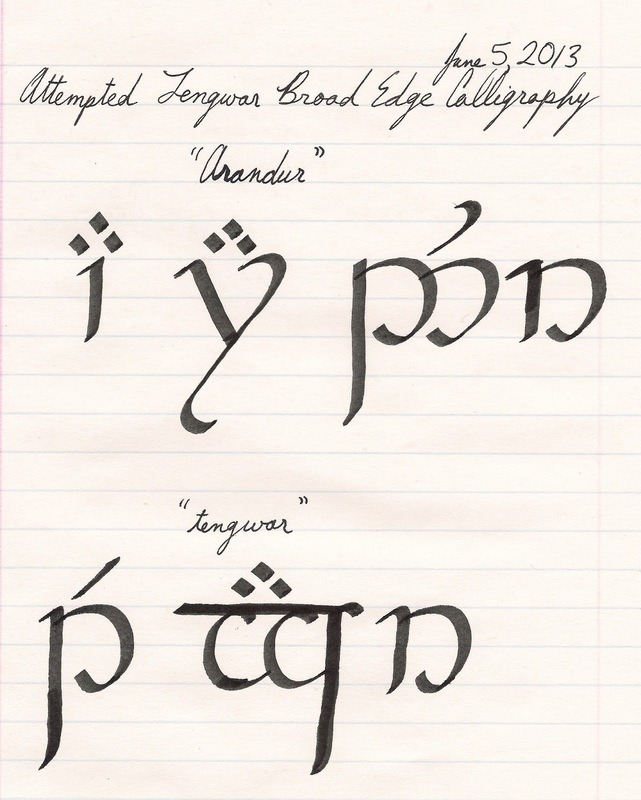 The primary difference between using Tengwar to write Quenya and using it to write Sindarin is whether vowels are placed over the letter that they follow or the letter that they precede. 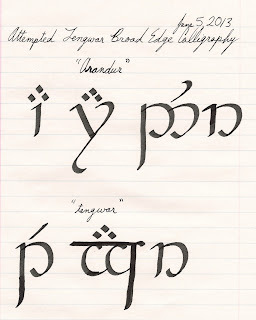 Here, the words "arandur" and "tengwar" are both written using the Quenya mode, which maintains the vowels being placed above the letter that they follow. The first word, "arandur," happens to be the Quenya word for "steward," which is a translation of the name "Spencer!" Thus, the name "Spencer" in Quenya is "Arandur."